Since I started in November as the Community Outreach Coordinator for Savannah I have begun connecting to families through social media, other Kudzu parents and our amazing medical community. What I have started to pick up on is the need for social opportunities for families living with a child with type 1 diabetes. The request to literally sit, talk, network and maybe even have a cup of coffee with someone experiencing the same daily ups and downs is becoming more evident for our Savannah community. I am beginning to focus on how Camp Kudzu South GA can foster these opportunities for families locally. Camp Kudzu is a vehicle for creating lifelong connections and experiences through our camp and programs for children living with type 1 diabetes. Locally, Camp Kudzu South GA is working to offer opportunities for our families to build community, build trust, and build a network of support that increases our family’s quality of life. 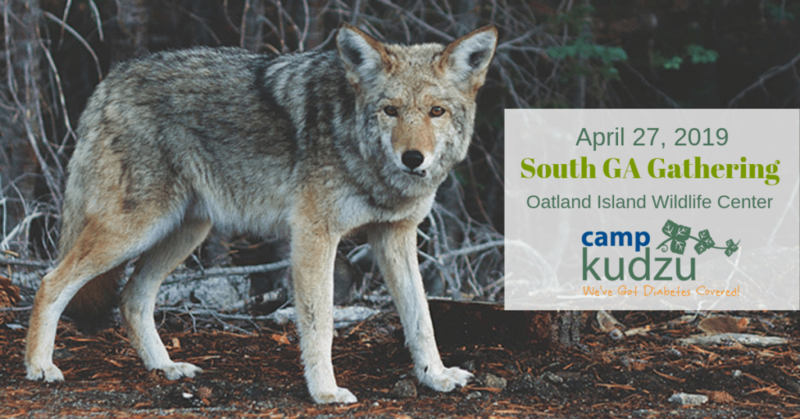 Please join us in Savannah Saturday, April 27th from 10am-12pm at Oatland Island Wildlife Center. This will be our first local gathering to meet new families, establish new connections and strengthen our local network. Admission to Oatland Island is covered for parents and siblings. Plan to bring a picnic lunch and your hiking shoes so we can hit the trails after a casual meet and greet. I am determined as the Community Outreach Coordinator in Savannah to support our type 1 families and increase their quality of life, particularly in the context of health. Learn More About our South GA Gathering. Follow our local South GA FB Page!